Perfect if you fancy a karaoke duet but also a decent buy for a band on a budget that needs some extra BV firepower. Retailer Gear4Music has teamed up with various manufacturers from around the world to develop their own line of music equipment with the intention of providing a range of sensibly priced musical instruments - a bit like a supermarket's own brand beans, we guess. 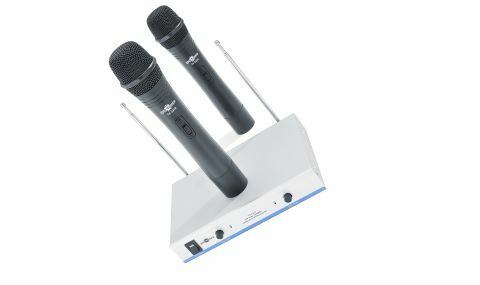 Their Dual Wireless Microphone System consists of two handheld wireless microphones and a wall wart-powered desktop receiver. The microphones each have their own transmitting frequency and a 50m range while the receiver sports front-panel volume controls for each mic and a pair of 1/4" jack outputs. Plug in the supplied lead to one output only and you'll get a mix of both mics but you can send the output of each separately if you have leads for both outputs. All the components are surprisingly well constructed for such an inexpensive system. The black mics are quite long, to accommodate the transmitter electronics and a PP3 battery - easily inserted by unscrewing the end cap - and each has a switch with three positions (off, standby/mute, on) with a red LED to show you it's powered up. A green LED on the receiver unit shows that it is getting signal. Operation really is dead simple. Just raise the antennae on the receiver, connect the output to a mixer/ PA, adjust the volume and let rip. We found that the mics were fine for vocals, putting in a performance that belied their low price. In a side-by-side comparison with the ubiquitous SM58 they were slightly quieter and had a little less clarity and bottom end warmth, but, at a street price of not much over 40 quid for two working mics, that's no cause for complaint.